Every Door Direct Mail® (EDDM) is an easy, cost-effective service offered by the U.S. 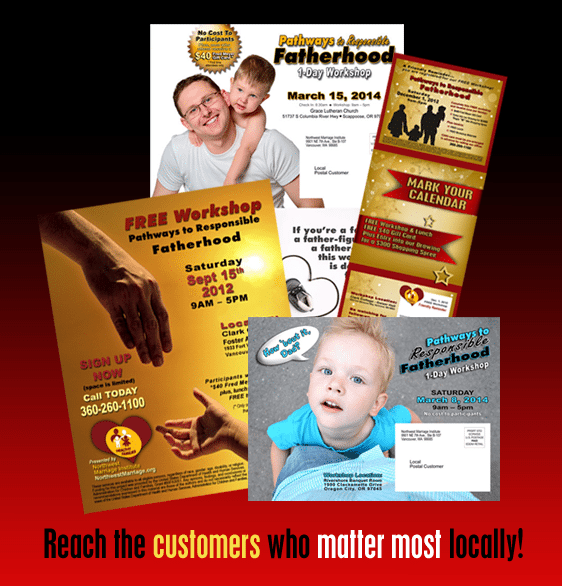 Postal Service®, designed to help your business reach potential customers in nearby neighborhoods. In the frenzy for new digital ways to market your business, it’s easy to overlook tried-and-true marketing strategies. That’s why there’s no better way to get your message into local homes and businesses OFFLINE than with EDDM. Plus, your mail piece, while advertising your product or service, can also include special promotions to drive traffic ONLINE to your web site, blog and social media sites, creating even more potential sales and opportunities to connect. 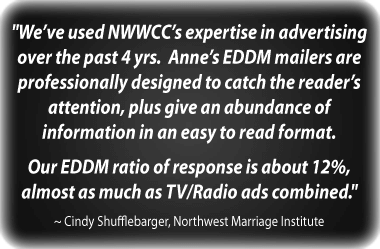 NWWCC offers the entire package or any portion of Every Door Direct Mail® (EDDM) services. Our graphic design team is ready to create your exceptional mail piece or make tweaks to your existing artwork, making sure it conforms to the USPS guidelines and standards. Once completed, we can hand off the artwork to you, or provide any or all of the following additional services. Printing / Mailing Lists / Paperwork / Delivery Just one call takes care of it all! We’ll execute the printing process, handling all the details from delivery to pick up. We’ll help select a mailing list of local postal routes perfect for your needs. We can take care of all the required paperwork, including bundling. We can even cover the postage, deliver your mail pieces to the post office and invoice you when it’s done. No postage permit required* Saves you the annual cost of buying one. No names or addresses needed Instead of printing names and street addresses, we use the approved EDDM format (Local Postal Customer). Reach local customers fast Send up to 5,000 mail pieces per day. We can map out a target area using demographic data (e.g. age, household income, and size) to select a delivery route. Plenty of room for your message EDDM offers a flexible range of sizes, making it ideal for announcing sales, sending coupons, and much more. Three of the most popular options are postcards (6.5″ x 9″), oversized postcards (8.5″ x 11″), and tri-fold menus (4.25″ x 14″). As close as your local Post Office â€“ When we’ve completed your EDDM project and selected a mailing drop off date, it’s then submitted to the Post Office that serves the area you want to reach. Your mailing pieces can be scheduled up to 30 days before you plan to mail them. If you prefer, you can do it yourself and pay for the postage directly, via the USPS website or at the Post Office with cash, check, or debit card. Otherwise, we take care of all the details and just charge for our time, plus the cost of postage. *Although there is no permit required, a Customer Registration ID is required to use the EDDM Retail service.